The global cosmetic ingredients market demonstrates a competitive and fragmented landscape owing to a wide pool of players operating with varieties of products, states Transparency Market Research (TMR) in a research report. The leading players operating in the global market for cosmetic ingredients are The Dow Chemicals, AkzoNobel, Croda International, and BASF SE. With the players introducing different and novel products with each passing day, the rivalry among the top drawer players is expected to intensify in the near future. 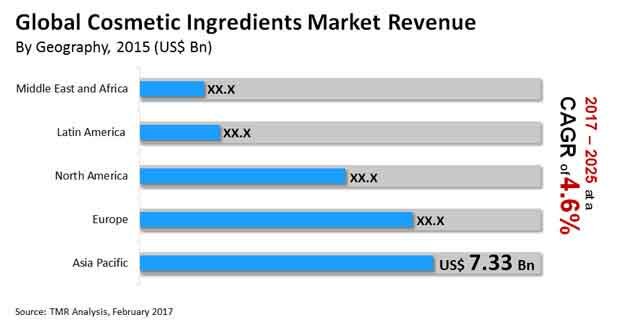 According to a TMR analyst, “The global market for cosmetic ingredients is expected to witness a 4.60% CAGR from 2017 to 2025. In 2016, the market was worth US$22.89 bn and is likely to rise to a valuation of US$33.80 bn by 2025. On the basis of function, the global cosmetic ingredients market has been segmented into coloring agent, moisturizing agent, and cleansing agent. Cosmetic ingredients are mainly used in these agents and are prominent in these segments. Amongst these, the segment that took the lead and is expected to maintain its leading position is the segment of moisturizing agents. This growth can be attributed to the high use of moisturizing agents in makeup cosmetics, hair care products, and skin care products. Giving tough competition to the segment of moisturizing agents, the cleansing agents segment is also likely to expand at a strong rate in the coming years. The growth of this segment can be attributed to the rising awareness of the benefits that are provided by cleansing agents such as efficiently removing dirt and oil from the skin. Region-wise, the global market for cosmetic ingredients is classified into North America, Asia Pacific, Latin America, and Europe. In 2016, Asia Pacific led the market with a share of 32.02% in the global level. This growth can be attributed to the strengthening economic status of Asia countries such as Japan, India, and China. This rise in income is being directly reflected in their living standards, eagerness to look good, and purchasing power. The continuity of this trend is expected to keep Asia Pacific in the top position till the end of the forecast period. There has been a significant rise in the aesthetic consciousness of consumers along with their interest towards appealing physical appearance. This trend has come forth owing to a significant rise in the disposable income consumers across the globe. The pursuit for beauty of consumers is further expected to fuel the demand for cosmetic ingredients in the coming years. The mounting awareness among consumers regarding skin care and an extensive surge in the use of anti-aging products is expected to bode well for the growth of this market in the long run. Factors such as growing awareness regarding clean-label cosmetic merchandises has resulted in the development of environment-friendly and green cosmetics. The advent of novel products and advanced ingredients along with all-embracing research and development is supported by the manufacturers of cosmetic ingredients for meeting specific consumer requirements. Though the future of this market is bright, the rise in the enforcement of strict rule and policies and standards regarding the use of different cosmetic ingredients is expected to inhibit the growth of the global cosmetic ingredients market. However, manufacturers can gain lucrative growth prospects from the changing tastes of consumers in terms of fashion and enhancing their physical presence.